Internet penetration remains low in Egypt, with only modest gains since 2015 (22% in 2013 vs. 45% in 2015 vs. 50% in 2017). Internet penetration is also much lower in Egypt than in the other surveyed countries (50% Egypt vs. 68% Tunisia, 80% Jordan, 91% Lebanon, 91% KSA, 95% Qatar, 99% UAE). Additionally, Egyptians have been using the internet for a shorter average amount of time than other nationals (5 years Egyptians vs. 7.6 years other nationals). Egyptians using the internet spend an average of 26 hours online per week, slightly lower than other nationals (29 hours). Average time spent online per week in Egypt, however, has increased (18 hours in 2013 vs. 23 hours in 2015 vs. 26 hours in 2017). The primary reasons Egyptians cite for not using the internet are similar to those cited by other nationals—they do not know how to use it/are confused by technology (41% Egypt vs. 38% other nationals) or they are not interested/do not find it useful (33% vs. 37%). Few Egyptians say a lack of internet access has been a barrier (1% no internet connection; 7% no computer/device; 7% too expensive). 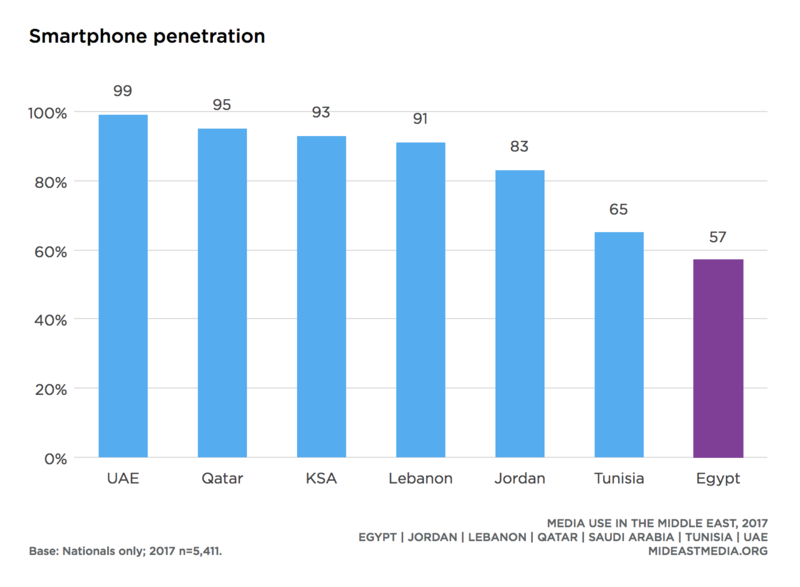 Consistent with internet penetration, smartphone ownership is also lowest in Egypt (57% Egypt vs. 65% Tunisia, 83% Jordan, 91% Lebanon, 93% KSA, 95% Qatar, 99% UAE). However, using smartphones to connect to the internet is rising and computer use declining (smartphones: 32% in 2015 vs. 47% in 2017; computers: 34% in 2015 vs. 20% vs. in 2017). Using tablets and e-readers remains uncommon (8% and 1%, respectively), a pattern similar to other Middle East countries. Almost all Egyptian internet users connected to the internet via mobile phone in the past month (98%). While overall less common, rates of connecting to the internet via Wi-Fi and mobile data service are similar to each other (67% each). Egyptians use the internet primarily to interact with others (46% see what friends and family are doing, 46% get messages via direct message, 45% get messages on social media, 45% post messages/comments on social media, 43% re-post others’ content, 42% post/share own multimedia content, 41% post messages/comments on direct message). Like other nationals, making or receiving calls over the internet has increased over time in Egypt (8% in 2013 vs. 37% in 2015 vs. 43% in 2017). However, Egyptians report lower participation rates in all internet activities compared to other nationals due to an overall lower internet penetration rate. When looking at internet users only, the differences are far less pronounced, except the dramatically lower likelihood of Egyptians to look for health information online (68% Egyptians vs. 88% other nationals). Four percent of Egyptians report participating in online job training or an online degree or certificate program in the past year, compared with six percent of other nationals. 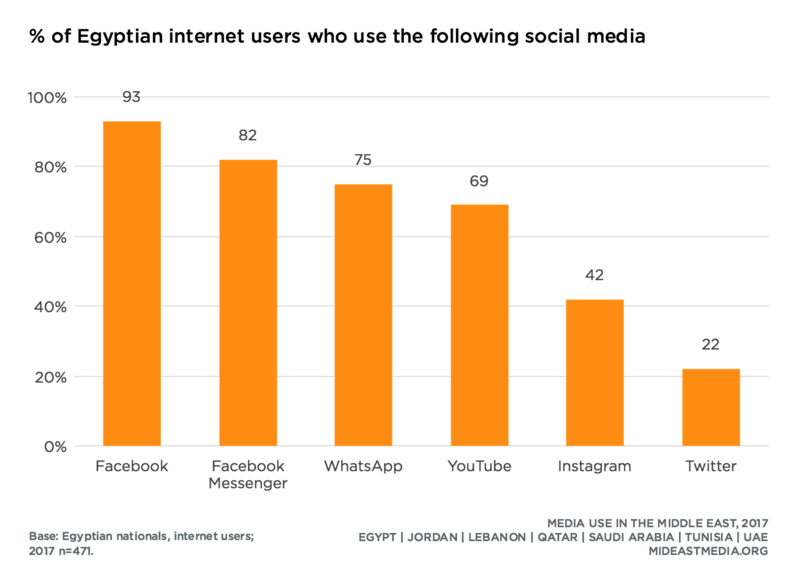 Egyptians increasingly embrace social media, as evidenced by increased use of multiple social media platforms. While internet penetration increased by only five percentage points since 2015, use of Facebook increased by 8-points, WhatsApp by 12-points, YouTube by 13-points, and Instagram by 17-points (2017: 47% Facebook, 38% WhatsApp, 35% YouTube, 21% Instagram). Twitter is the only platform not experiencing broader use since 2015 (11% in 2017). Rates of social media usage increased even more among internet users only. Compared with 2015, use of Facebook among internet users increased by 5 percentage points, Facebook messenger by 37-points, WhatsApp by 17-points, YouTube by 20-points, and Instagram by 32-points (2017: 93% Facebook, 82% Facebook messenger, 75% WhatsApp, 69% YouTube, 42% Instagram). Twitter is the only platform that did not increase in use—down 3-points since 2015 (22% in 2017). 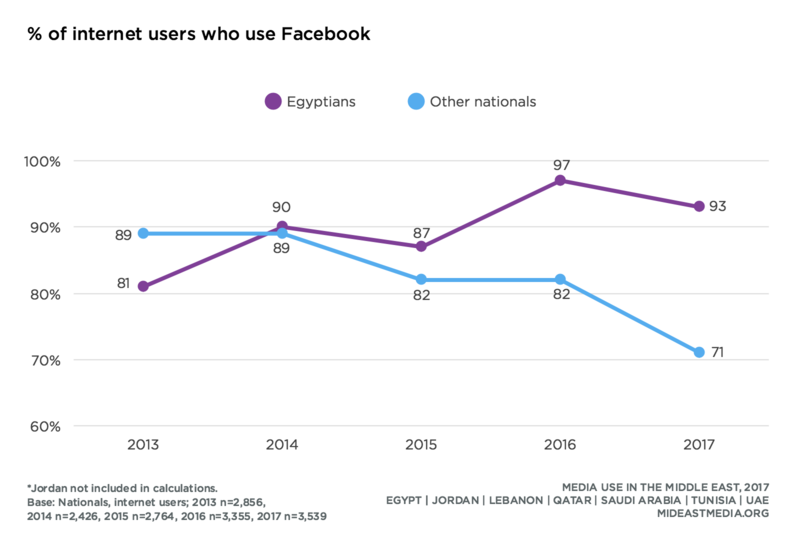 Compared with other nationals, Egyptians are using Facebook at increasing rates while Facebook’s popularity is declining among their Middle Eastern counterparts (Egyptian internet users: 81% in 2013 vs. 93% in 2017; other nationals using the internet: 90% vs. 74%). And stable Twitter usage across Egyptian internet users contrasts with a nearly fifty percent decrease usage rate among internet users in other counties (Egyptians: 23% in 2013 vs. 22% in 2017; other nationals: 47% vs. 24%). Less than half of Egyptians use direct messaging (46%). Of those, the vast majority of chats are with individuals as opposed to groups (85% individual vs. 15% group). This represents not only the lowest group messaging rate across the region (50% other nationals), but also a decline since 2015 (32% in 2015). Along with Qatar, Egypt is the only country where messaging via group chat decreased over time. Among those few using group chats, Egyptians are more likely than other nationals to group chat with friends and less likely to group chat with family (friends: 90% Egyptians vs. 76% other nationals; family: 64% vs. 75%). Nearly all Egyptians watch TV, similar to nationals in other countries (96% Egyptians vs. 93% other nationals). However, they are less likely than other nationals in the region to use other types of offline media, including radio , newspapers, books, and magazines (radio: 33% Egyptians vs. 49% other nationals; newspapers: 16% vs. 25%; books: 16% vs. 29%; magazines: 11% vs. 19%). As in other countries, newspaper readership in Egypt declined over time, from 25% in 2013 to 24% in 2015 to only 16% in 2017. Egyptians consume TV almost exclusively in Arabic (96% Arabic, 6% English). By comparison, while increases in internet use in Arabic rose proportionally with overall internet use, the rate of using the internet in English remains unchanged (Arabic: 43% in 2015 vs. 49% in 2017; English: 11% in 2015 vs. 12% 2017). Comedy is the most popular TV genre in Egypt followed by news (77% and 61%, respectively). While comedy viewership on TV remains relatively stable over time , TV news viewership declined steadily over the same timeframe (comedy: 64% in 2013 vs. 81% in 2015 vs. 77% in 2017; news: 85% vs. 68% vs. 61%). Less than half of Egyptians watch spiritual content, sports, or social satire on TV (47%, 39%, and 30%, respectively). Compared to other nationals, Egyptians watch more comedy on TV, but less news and satire (comedy: 77% Egyptians vs. 67% other nationals; news: 61% vs. 67%; social satire: 30% vs. 51%). Egyptians and other nationals watch spiritual content and sports in equal proportions (spiritual: 47% Egyptians vs. 50% other nationals; sports: 39% vs. 41%). Online watching rose since 2015 across news, comedy, sports, and social satire (news: 30% in 2015 vs. 36% in 2017; comedy: 24% vs. 31%; sports: 14% vs. 24%; social satire: 13% vs.19%). Still, because of the lower overall internet penetration, Egyptians watch proportionally less content online compared to other nationals. Considering specifically internet users, the proportion of Egyptians watching news online is relatively unchanged over time, while the rates of viewing comedy, sports, and social satire online rose (news: 76% in 2013 vs. 67% in 2015 vs. 72% in 2017; comedy: 30% vs. 52% vs. 62%; sports: 32% vs. 31% vs. 48%; social satire: 29% in 2015 vs. 38% in 2017). Even among internet users, Egyptians are more likely than other nationals to watch news online but less likely to watch comedy and social satire (news: 72% Egyptians vs. 66% other nationals; comedy: 62% vs. 71%, social satire: 38% vs. 56%). 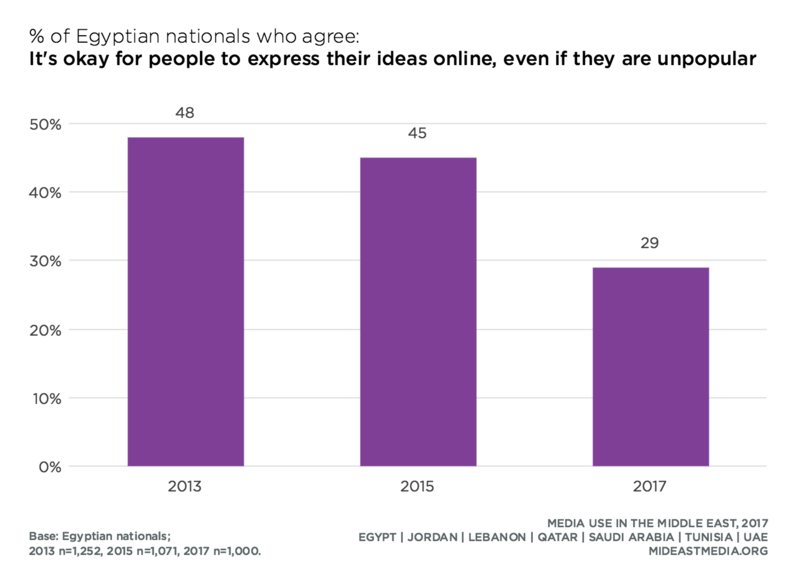 In Egypt, the percent who feel it is okay for people to express their ideas on the internet even if they are unpopular declined sharply over the past two years (48% in 2013 vs. 45% in 2015 vs. 29% in 2017). Further, one in three Egyptians say it is safe to talk about news and current affairs on the internet (30%). One in three also say they feel comfortable saying what they think about news and current affairs in general (33%). Half of Egyptians say the internet in their country should be more tightly regulated, unchanged from 2015 (42% in 2013 vs. 49% in 2015 vs. 49% in 2017). Only Qataris and Emiratis are less likely to support stronger internet regulation (39% Qatar, 41% UAE, 49% Egypt, 56% Tunisia, 57% Jordan, 57% KSA, 77% Lebanon). Drilling down to specific types of internet regulation, nearly half of Egyptians feel the internet in their country should be more tightly regulated to protect user privacy, less than all other nationals except Emiratis (44% UAE, 47% Egypt, 53% Jordan, 53% Qatar, 54% KSA, 56% Tunisia, 75% Lebanon). Perhaps the greater support for regulations protecting user privacy springs from the growing number of Egyptian internet users worrying about companies checking their online activity, doubling since 2015 (31% in 2013 vs. 24% in 2015 vs. 48% in 2017). Only Saudis and Tunisians show more concern about companies monitoring their internet activities (21% Qatar, 35% Jordan, 35% UAE 46% Lebanon, 48% Egypt, 53% KSA, 53% Tunisia). Four in 10 Egyptians think the internet should be more regulated to keep it affordable and to regulate content related to news and current affairs. On average, one in five Egyptians say privacy concerns have changed the way they use social media, similar to other nationals (19% Egyptians vs. 20% other nationals). Among those changing habits due to privacy concerns, Egyptians are more likely than any other nationals except Qataris to have changed their privacy settings but less likely to have changed or stopped using some social media services (changed privacy settings: 48% Egyptians vs. 33% other nationals, stopped using social media services: 12% vs. 20%; changed social media services: 6% vs. 15%). Three-quarters of Egyptians get news and news headlines from TV on a daily basis, similar to nationals from other countries (77% Egyptians vs. 78% other nationals). Driven by overall lower smartphone ownership, fewer Egyptians get news on a smartphone daily (42% Egyptians vs. 67% other nationals). However, among the nearly sixty percent (57%) who own a smartphone, 83% get news and news headlines on their smartphone at all and 71% do so daily. Additionally, 73% of Egyptian smartphone owners watch news videos on their smartphone at all, and 46% do so daily. Egyptians say television is by far the most important source for news and information but not as important as they indicated in 2013 (84% in 2013 vs. 75% in 2015 vs. 74% in 2017). Interpersonal sources have also declined in importance in Egypt as a source for news and information (64% in 2013 vs. 73% in 2015 vs. 54% in 2017). Egyptians say online sources are generally as important for news and information as they were in 2015 (social media and direct messaging are slightly more important in 2017) but are far less important in Egypt than other countries due to lower internet penetration (importance for news: internet in general: 47% Egyptians vs. 80% other nationals; social media: 42% vs. 70%; direct messaging: 34% vs. 69%; news apps: 26% vs. 50%). In terms of specific news sources, most Egyptians report watching Al Nahar (76%), Al Hayat (74%), CBC (66%), and Al Mehwar (51%) in the past week. Many fewer have watched Al Arabiya (25%), BBC (17%), or CNN (11%). While viewership rates of Al Arabiya are lower, rates of watching BBC and CNN are similar in Egypt compared to other countries. Egyptian authorities did not permit asking about Al Jazeera. 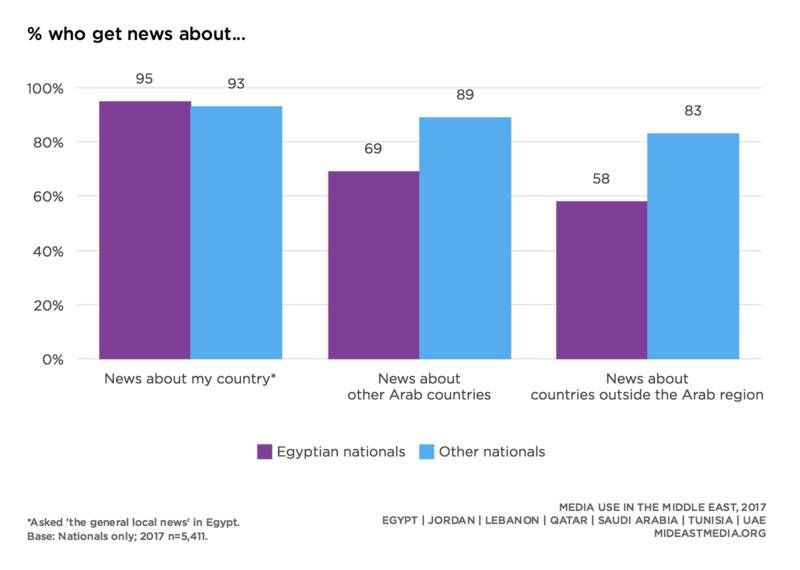 Egyptians express much more interest in local and national news than news from outside the country. Additionally, compared to nationals from other countries far fewer Egyptians follow news from outside their borders. While almost all nationals from all countries follow news about their own country and local community, Egyptians are less likely than other nationals to follow news about other Arab countries or countries outside the Arab region—by 20 to 25 percentage points (follow news about other Arab countries: 69% Egyptians vs. 89% other nationals; countries outside the Arab region: 58% vs. 83%). Additionally, only one in five Egyptians believes people benefit from consuming news from foreign news organizations, similar to 2015, but far lower than any other nation (19% Egypt, 28% UAE, 28% Jordan, 33% Qatar, 48% Tunisia, 50% KSA, 54% Lebanon). Egyptians are most likely to follow news about current affairs, arts and entertainment, and spirituality (91%, 78%, and 76%, respectively). 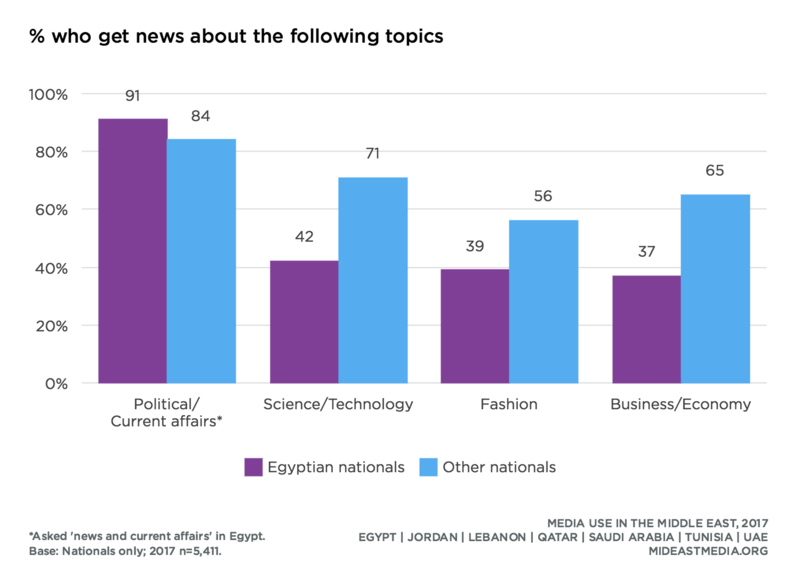 Yet Egyptians are far less likely than other nationals to follow news about education (50% Egyptians vs. 66% other nationals), science and technology (42% vs. 71%), fashion (39% vs. 56%), or business and technology (37% vs. 65%). Egyptians increasingly spend more face-to-face time with family, rising from 9 to 20 to 31 hours per week across 2013, 2015, and 2017. During the same time period, face-to-face time with friends remains unchanged at about 11 hours on average per week. Egyptians’ average weekly online face time with family and friends is similar to other nationals (other nationals: 33 hours with family, 13 hours with friends). Despite relatively stable internet use over the past two years (45% in 2015 vs. 50% in 2017), Egyptians’ over those same two years now spend double the number of hours per week online with friends (4.4 hours in 2015 vs. 8 hours in 2017); this is comparable to their Middle Eastern counterparts who are otherwise more likely to be online (8 hours with friends online Egyptians vs. 10 hours other nationals). 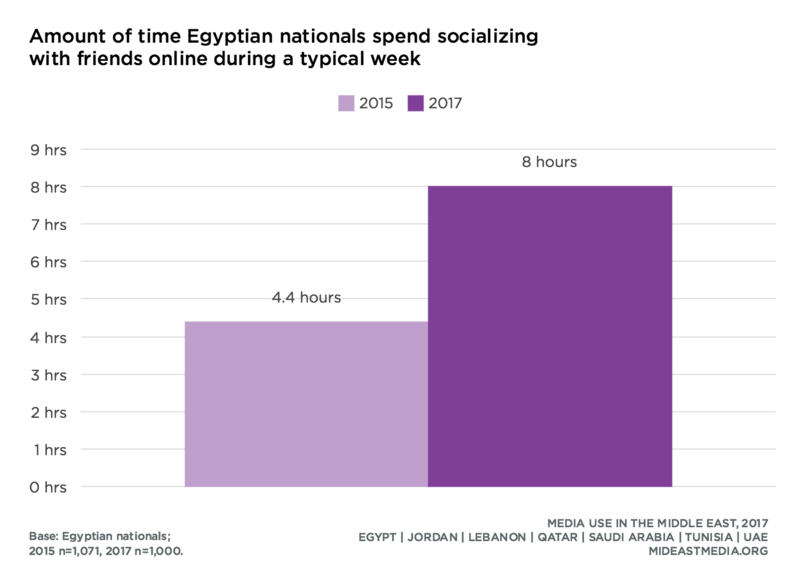 The time Egyptians spend online with family is relatively unchanged from 2015 and lower than other nationals (Egyptians: 3 hours in 2015 vs. 4 hours in 2017; other nationals: 8 hours in 2017).